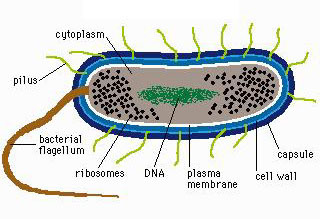 Bacteria: single-cell organisms with no nucleus. What does it mean if an organism is said to be autotrophic? Since bacteria have no organells surrounded by a membrane, making them prokaryotic cells. As the RNA of bacteria became better understood, scientists realized that there were two vastly different types of bacteria. These groups were so different that there are now two kingdoms of bacteria. Details about the diffferences in these two kingdoms of bacteria can be found in our current biology textbook. The kingdom Archaebacteria is relatively small, consisting of three main phylogenetic groups. Methanogens: oxygen is a poison to these bacteria, so they must live in anaerobic conditions. They produce energy by converting H2 and CO2 into methane gas. Extreme Halophiles: these "salt-loving" bacteria live in environments with a very high salt concentration that would kill most other bacteria. Extreme halophiles use salt to generate ATP for energy. Thermoacidophiles: these bacteria live in extremely acidic environments (pH less than 2) that have extremely high temperatures (up to 110o C). The kingdom Eubacteria contains the bacteria commonly referred to as germs. This kingdom contains most of the world's bacteria, divided into as many as 12 different phyla based on their evolutionary relationships. Representatives of this kingdom are the most widely distributed organisms known to man. While they are most abundant in temperate environments, (normal human body temperature is perfect for bacterial growth), some species are known to live in environments ranging from temperatures near the boiling point of water to well below the freezing point of water. 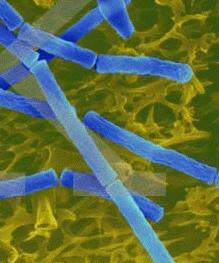 The rod-shaped bacteria pictured below is Escherichia coli, a bacteria commonly found in the human digestive system. 1. What is the scientific name of anthrax? Cocci - round bacterial cells. Bacilli - rod-shaped bacterial cells. Spirilli - spiral-shaped bacterial cells. 2. What is the shape of an anthrax cell? staphylo - a prefix used with the shape name to indicate clusters. 3. Do anthrax cells form one of these cluster types? Obligate anaerobes - cannot survive in the presence of atmospheric oxygen. Facultative anaerobes - can live with or without atmospheric oxygen. Obligate aerobes - cannot survive without atmospheric oxygen. 4. What is the respiration type for anthrax cells? Cells on a microscope slide are stained with a purple dye solution called crystal violet. The cells are then washed with water. An iodine stain solution is applied to the cells. The slide is then washed with alcohol. Finally, the cells are restained with a pink dye solution called safranin. Gram-positive bacteria have a thick peptide layer, retain the crystal violet, and appear purple when viewed under a microscope. Gram-negative bacteria have a thin peptide layer, take up the pink stain, and appear pink when viewed under a microscope. Many antibiotics have no effect on gram-negative bacteria. 5. Are anthrax cells gram-positive or gram-negative? Cell wall - some rigid and others flexible. Cell membrane - same as other cells. Cytoplasm - same as other cells. DNA - a single, circular chromosome located in the cytoplasm. Remember, bacteria cells do not have a nucleus. 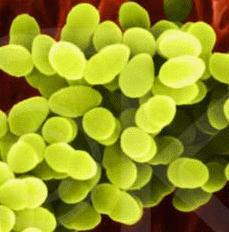 Capsule - a thick, gel-like, protective coating on some bacteria cells. Pili - short, hairlike protein structures on the surface of some bacteria that help them stick to host cells. Flagella - long protein structures that turn to propel some bacteria cells. 6. Do anthrax cells have cell parts related to motion? 7. Do anthrax cells form capsules? Most are heterotrophic - use food produced by other organisms. Bacteria that feed on dead or decaying organic matter are heterotrophic bacteria called saprophytes. Some are autotrophic - able to produce their own food. Photoautotrophs - use sunlight as a source of energy like plants. Chemoautotrophs - use energy from chemical reactions to make their food. 8. Anthrax cells are heterotrophic. There are three forms of the anthrax disease, based on how the spores or cells come into the body. What are they? Strep throat is caused by streptococcus bacteria. When you go to the doctor with a sore throat, they swab your throat and have you wait for the results of the "culture" to see if you have strep throat. What does the "culture" look like if you have strep throat? Some bacterial infections are known as "staph infections". What does the name of this illness tell you about the bacteria? Not all bacteria cause infections in your body. Give an example of a bacteria that always lives inside your body. Use "Google" to search the Internet for Cyanidium caldarium. Describe the living conditions of this organism. 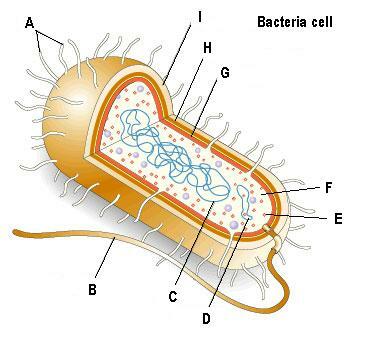 Copy this bacteria picture and then label the parts. Cyanobacteria: these bacteria are photosynthetic, carrying on the same chemical processes as green plants. 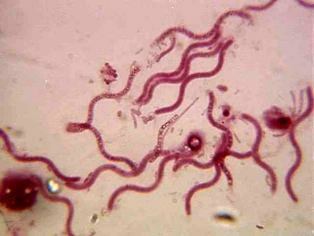 Spirochetes: gram-negative, spiral-shaped, heterotrophic bacteria that move with a corkscrew-like rotation. These bacteria live freely in the environment or have a symbiotic or parasitic relationship with other organisms. Gram-positive bacteria: this large group of bacteria includes the streptococci bacteria that cause strep throat, the lactic acid producing bacteria that turn milk into yogurt, the lactobacilli that cause tooth decay, and soil bacteria that produce many antibiotics. Proteobacteria: this group of gram-negative bacteria includes the human intestinal bacteria Escherichia coli, bacteria that extract energy from minerals, and nitrogen-fixing bacteria that convert atmospheric nitrogen into nitrates in the soil. 9. To which of these phyla does anthrax belong? Asexual, by binary fission - the DNA replicates and then the cell pinches inward and splits in two. Conjugation - two cells exchange a portion of their DNA across a bridge formed between the cells. New material replaces old material in the cell. While this increases the genetic variability in the organisms, it is not true sexual reproduction. Endospores - during adverse conditions, the DNA is encased in a protective envelope. This endospore can lie dormant for years or until favorable conditions return. 10. Under what conditions do anthrax cells form spores? 11. What element is needed for anthrax spores to survive prolonged periods in the soil? 12. Coming into contact with one spore does not give you anthrax. How many spores are considered an infectious dose for humans? Toxins: substances that disrupts the metabolism of other organisms. Endotoxin - made up of lipids and carbohydrates associated with the outer membrane of gram-negative bacteria. These toxins are some of the strongest poisons known to man and cause violent reactions in host organisms. 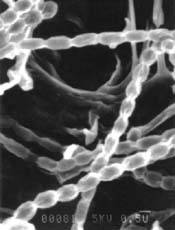 Exotoxin - proteins produced inside gram-positive bacteria cells and secreted into the environment. These toxins usually produce fever, weakness, and capillary damage. 13. The exotoxin produced by anthrax cells has 3 "factors". What are their 2-letter names? 14. A combination of two of these factors causes edema. What is edema? Chemicals that inhibit the growth of some bacteria. Penicillin is an antibiotic that interferes with cell wall synthesis. Tetracycline is an antibiotic that interferes with bacterial protein synthesis. Many antibiotics are derived from chemicals that bacteria and fungi produce. The over-use of antibiotics through the years has lead to some bacteria that are almost immune to treatment with them. Study these five pages about the treatment of anthrax. 15. What are the symptoms of someone with inhalation anthrax? 16. What are the symptoms of someone with cutaneous anthrax? 17. What antibiotics, besides Cipro®, can be used to treat anthrax? 18. What dosage of Cipro® is given to infected children? The abstract of this paper is at the beginning. How many bacterial toxins are referred to in this paper? The introduction paragraph of the paper defines "bacterial toxins". Write that definition. Use Webster's Online Dictionary to define the term deleterious. The conclusion, "summary", of this paper "restates" the three things that bacterial toxins do to harm other cells. Write those three things. Why should antibiotics not be used for most sore throats? What percent of all antibiotics manufactured in the U.S. are used on livestock? Besides preventing disease, for what other reason are livestock given antibiotics? What does the bacteria that causes strep throat look like? 19. How is the vaccine for anthrax made? 20. 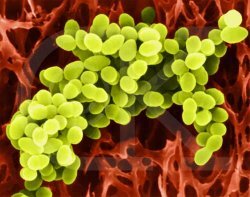 How does Ciprofloxacin® kill bacteria? 21. Before anthrax, how was Cipro® most commonly used? 22. What is the wholesale price per pill of Cipro® in the U.S.? 23. What is the danger of giving Cipro® to children? Some invading bacteria are easy for your immune system to kill, while others are very hard. There might be several reasons for this, but one reason is related to a particular cell part that most of the bacteria that are hard to kill have in common. What is this cell part and why does it make them hard for your body to kill them? The CDC has some good information about foodborne botulism. What is the scientific name of the bacteria that causes botulism? What is the most common cause of foodborne botulism? The symptoms of botulism are all caused by the toxin released by this bacteria doing what to the body? How is botulism treated once a person has it? Why should children less than 12 months old never be given honey? An autotrophic organism can makes its own food. Escherichia coli is a bacteria that lives in the human intestine and aids digestion. The cells of the bacteria that cause strep throat are round and clump together in clusters.